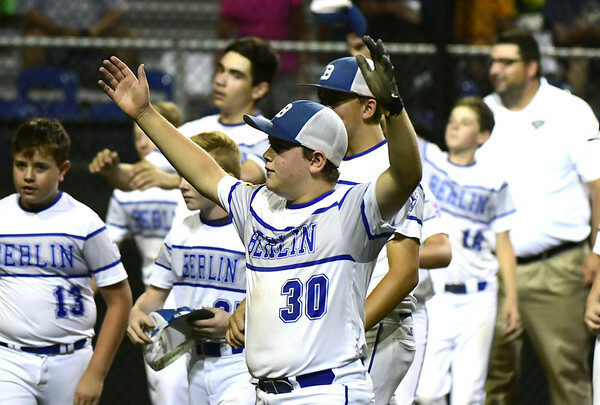 BRISTOL - Maryland cruised to the Little League Mid-Atlantic Regional championship game defeating New Jersey 11-1 in five innings behind an impressive start from starting pitcher Stephen Wade and an offensive outburst. Wade went all five innings for Maryland Friday night and struck out 10 New Jersey batters, limiting it to just four hits in the game. Offensively, Maryland had multi-hit games from four of its batters. Alex Navarro, Lukas Loring, Case Tilghman and Kannon Cropper all had a pair of hits. Loring and Tilghman each drove in a pair of runs. The majority of Maryland’s offense came in the bottom of the fourth. Tilghman started the inning off with a double. Cropper followed him up with a single to left field. New Jersey then recorded a pair of outs before Briggs Pugner ripped a two-run single to center field. Foster Smith followed it up with a RBI single to make it 6-1 Maryland. New Jersey decided to intentionally walk Owen Knerr, who hit his fifth home run of the tournament earlier in the game. With the opponents focusing on him, Maryland has a strong hitter behind him in Navarro. “I’m excited because I know he’s going to get a hit behind me,” Knerr said. While Knerr was on first base the guys hitting behind him didn’t skip a beat. Navarro reached on a dropped third strike. Loring had a RBI single, which loaded the bases and Knerr scored on a wild pitch for the fifth run of the inning before Tilghman hit a ground ball to score Navarro. Dylan Briggs, Jason Quardt, Joey Wall and Brody Tacca had the four hits in the game for New Jersey. With the win Maryland will face New York tonight at 7 p.m. with a chance to go to the Little League World Series on the line. If Maryland wins, it will have beaten every team in the region. Just because Maryland and New York have yet to play doesn’t mean both teams haven’t been watching each other. Posted in New Britain Herald, General Sports on Friday, 10 August 2018 21:18. Updated: Friday, 10 August 2018 21:20.